Polar FT80 is still the best strength training watch on the market today among heart rate monitors according to the Heart Rate Watch Company. "There is no other strength training watch on the market that uses the graphic recovery indicator, which is a big plus," says Rusty Squire, President of the Heart Rate Watch Company. He adds, "Plus the black version now has greater contrast and works outdoors, inspite of what articles all over the internet say because that is outdated information, just like so much of the web search information is." For 2013 Polar added the new H1 transmitter which is thinner and the new Polar soft strap, which is more reliable than the Wearlink fabric and fits like a second skin. "This was a great upgrade and we voted it the most comfortable heart rate strap for 2013," says Squire. 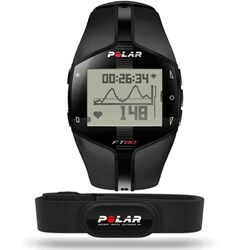 Polar FT80 offers Polar Owncode, which connects to over 90% of all gym equipment that is heart rate enabled and it is the only of the Polar heart rate monitor units that has a customized strength training program. "The Polar Star Trainer and calories total and from fat are also nice features, along with the fitness test," says Squire. "The FT80 also offers you three distinct heart rate zones so you can have a customized fat-burning zone, aerobic zone and interval training zone, which is nice compared with single zone watches," says Squire. He adds, "All the batteries are user changeable and you can buy two at Wal-Mart for about $ 3.90, in fact, I did just the other day because I change my batteries every 9 months or so on both the watch and the transmitter." Polar FT80 comes with the Polar Flowlink data transfer device which uploads watch workout data to the free online Polar Personal Trainer software. "You can build custom strength training workouts in Polar Personal Trainer and upload them to the FT80 so it becomes a coach/task master right on your wrist," says Squire. The Heart Rate Watch Company offer a complimentary copy of "How To Elevate Fitness With Strength and Interval Training" to all customers and the book is especially poignant to those who buy the Polar FT80 watch. "If you'd like expert advice and consultation then simply call us at 866-586-7129," says Squire. He adds, "It is the fastest way to cut through all the clutter of bad information that is out there on the web and talk to a real expert who uses and knows the product."